one + = 6 Required Please enter the correct value. Yes, the Square stock price is having one of its most volatile weeks since its Nov. 19 debut. Shares of financial tech firm Square Inc. (NYSE: SQ) are down 6.2% this week after the company released its first-ever earnings report after the bell on Wednesday. For the fourth quarter, the firm lost $0.34 per share and raked in $374 million in revenue. Analysts had expected a loss of $0.13, so Square missed that estimate. However, it beat revenue expectations of $343 million. But despite the mixed numbers, there's one reason why the Square stock price could climb higher in 2016. Despite the mixed top and bottom lines, the Square stock price immediately jumped 3.9% to $12.40 in post-market trading. But the rally quickly faded when shares declined by 6.1% on Thursday. As of 10:30 a.m. today (Friday), SQ stock is down 0.9% to $11.23 a share. Another reason shares tanked this week is the company's surging losses. 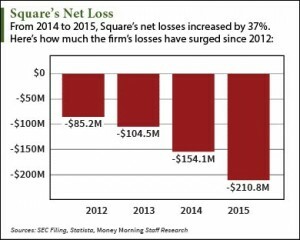 From 2012 to 2015, Square's annual net losses skyrocketed 147% from $85.2 million to $210.8 million. The company reported losses reached $6 million in the fourth quarter alone. Square hit the $1 billion revenue mark for the first time last year, raking in a total of $1.3 billion for FY 2015. A large portion of this growth came from the company's once-fledgling Square Capital service, which lets merchants using Square's credit card readers borrow money and pay it back gradually. These merchants return a small percentage of daily sales, which means the more they sell, the more they pay back. "As a growth investor, I'm not concerned that its losses are rising," Robinson said today. "Square's razorblade model is what's pushed it to $1 billion in revenue, which is a pretty huge threshold." You see, the razorblade model is when a company sells one product at a discount and sells another product that's dependent on the first at a premium. For example, you can buy a razor for cheap, but the replacement blades are expensive. These high-priced replacement blades are what rake in most of the profit. Square replicates this model by selling both its credit card readers and giving loans via Square Capital. 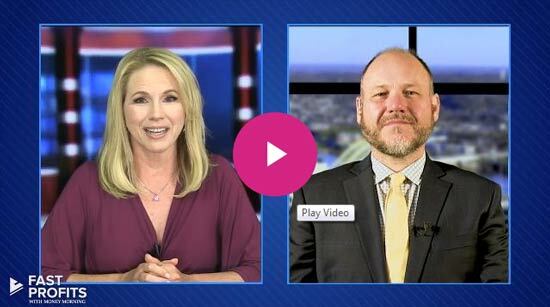 The reader is mostly meant to enable Square Capital's loan-lending side of the business. In other words, the reader is the razor and the loans are the blades. "Square is a mobile-centric company, so it's hard to see where their capital will go specifically," Robinson said, "but their razorblade model is a good indication that they're making more from spending more." The Bottom Line: Thanks to a mixed first earnings report, the Square stock price has fallen more than 6% this week. Many investors panicked when they saw the company's losses hit $211 million. But investors shouldn't be concerned about Square's lack of profitability. With unstoppable revenue growth and a razorblade business model, Square stock is a great long-term tech stock for 2016. Alex McGuire is an associate editor for Money Morning. You can follow him on Twitter at @AlexMcGuire92.